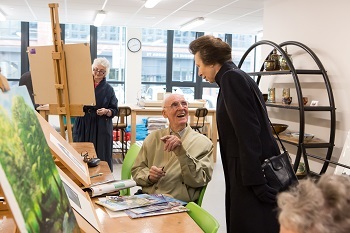 To mark the Grand Opening of The Chocolate Quarter, Her Royal Highness, who is attending as Honorary Member of the Society of Merchant Venturers, was given a tour of the site by Chief Executive of the St Monica Trust, David Williams and Master of the Society of Merchant Venturers, Charles Griffiths. Also in attendance was the Lord Lieutenant of Somerset, High Sheriff of Somerset, Chair of BANES and the Mayor of Bath. The tour showcased the facilities in the new £60 million intergenerational development including a cinema, restaurants, health spa, pottery studio and Charterhouse, a state-of-the-art 93-bed care home. The Princess Royal then joined residents and staff for an afternoon tea and unveiling of a commemorative plaque. Following the tour, The Princess Royal switched on a unique art installation to mark the start of the Grand Opening weekend on Saturday 14th and Sunday 15th April. A vast sun glowed between the iconic red-brick buildings radiating warmth, light and sound for a sensory exploration that the public were invited to discover and walk beneath. Seven metres high and six metres wide, the sun created an impressive, interactive experience for all the family. The Chocolate Quarter offers luxury retirement living for a new generation of retirees, with communal facilities built not just for the people living there, but also people from Keynsham and the surrounding area. The intergenerational development is gaining national interest as it combines luxury retirement living with a range of facilities which are open to the public, including a pizzeria, restaurant, health spa, cinema, hairdressers and nail bar. The Chocolate Quarter also uniquely includes office space for local businesses, such as Pukka Herbs, IVC and St Augustine’s surgery.